If you are planning on going on vacation or to any festivals this summer, then you need to make this easy crossbody crochet boho bag! This simple crochet bag pattern was inspired by a festival/beach boho fashion, which is so pretty and full of fringing. I wanted to make and share a pattern that is super easy for any newbie crocheters because I think of myself as more of a knitter, I don’t really have a wide knowledge of crochet stitches, so I’m still learning myself and creating patterns for others who are starting out and developing their skills. I made the bag using the tape yarn from we are knitters in this summer bright minty colour. 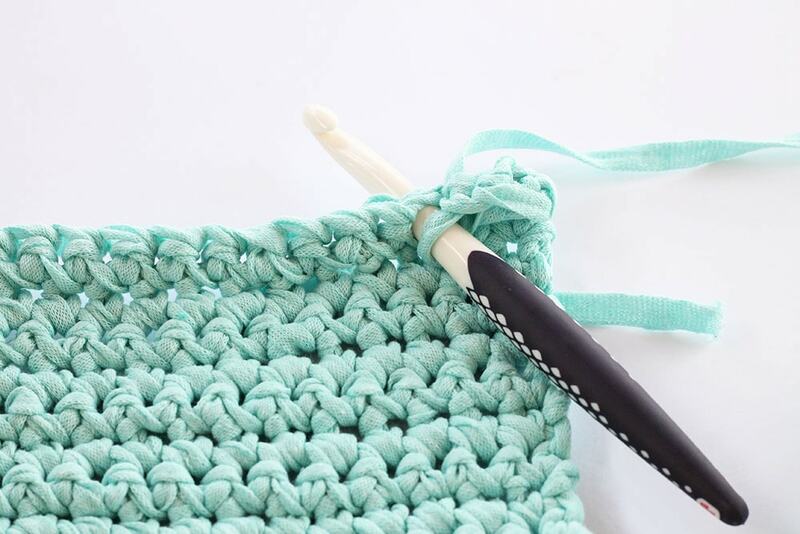 It’s so great to crochet with and I used my size 10mm (US N/15) crochet hook, which made it really fast to make. This bag is not only great for festivals, but you can also take it on vacation with you to wear at the beach or sightseeing. This crochet bag pattern has been made with those spring/summer festivals in mind. Great for standing in a field or on the beach with friends and drinks watching your favourite band, it has a crochet long strap, to wear across your body. Large enough to hold your essentials; phone, money, lipstick etc. You could adapt the strap or bag body size to your own specifications, for instance, making the strap shorter or adding some sort of fastening to close the bag. This is an excellent beginner crochet project, that will introduce you to creating a chain and single crochet. It’s really simple to make, with a little bit of counting involved and some knowledge of basic crochet stitches. 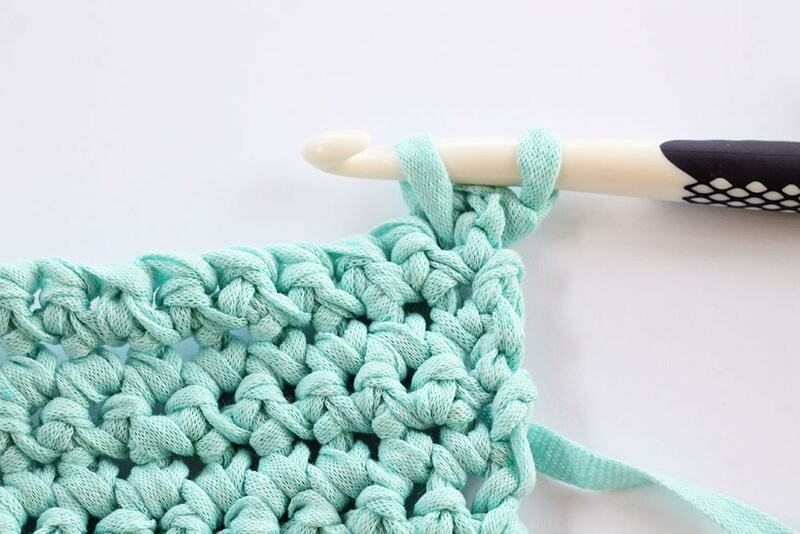 You start with a simple chain, then single crochet into every stitch, it’s really that easy! Then you add the crochet fringe edging along the bottom and a crossbody strap. I have a video tutorial page for basic crochet stitches to help you if you need it. 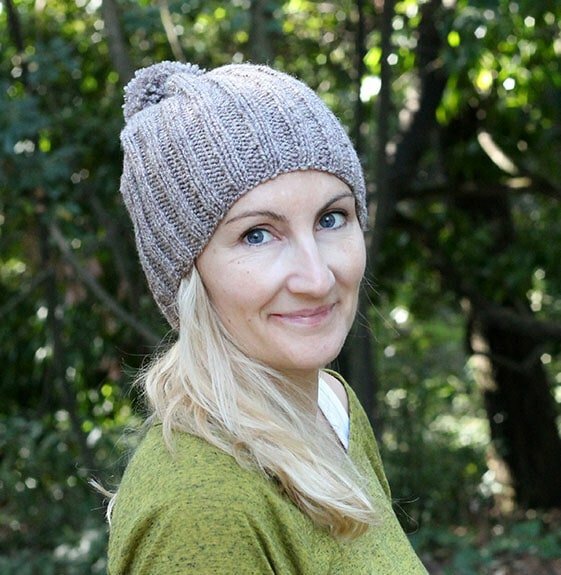 If you need help with any of the instruction in the pattern, please visit my ‘learn how to crochet’ page, which has video tutorials to help you. 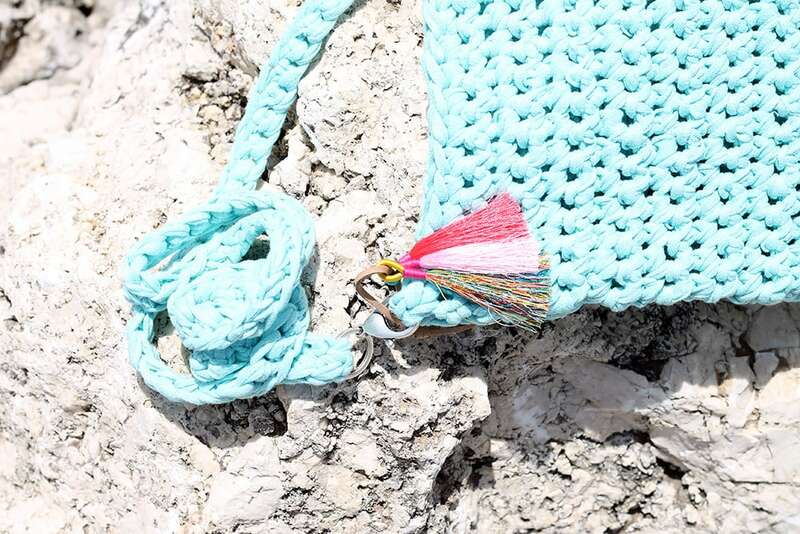 This crochet purse can be used for holding all of your essentials during your festival weekend, at the beach or anywhere else you want to take it. I’m planning on using mine for beach drinks (all of the summer stuff I am making right now is going to be great for the beach!) when the weather gets warmer, it will look so good with any summer outfits. Cut yarn and pull through the last loop to secure. Stitch the side seams of the bag – I used a simple mattress type stitch, collecting a stitch on one side, then threading my needle into a stitch on the other side, continuing to do that for each side seam. The bag strap – Loop the rings through the bag clips, then feed one end of the bag strap through one ring. Stitch it into place and make sure you have the right side facing outwards. Do the same to the other end of the strap. Place the clips into open stitches on either side of the bag. The decoration – I added 3 thread tassels to the side of the bag for some colour on a piece of leather. You can add whatever you want here, pom poms, key rings, large tassels etc. I found the tassels in a local craft shop. 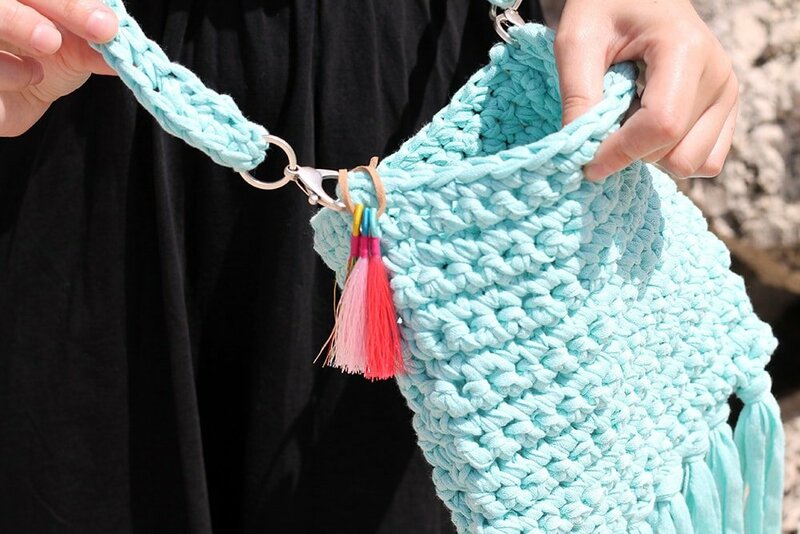 To finish off this bag, you need to attach the crochet fringe edging along the bottom of the bag. Cut 4 yarn lengths = 18″ for each section of fringing you want. 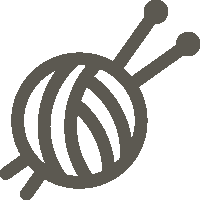 Hook into a stitch in the bottom of the bag near to the edge and pull through, pushing the ends of the yarn through the loop and pulling to secure. This is really easy to do and I have a video tutorial to show you how to do it. If you enjoyed making the pattern, I’d love to see yours on Instagram, be sure to tag me @handylittleme. Hi, was one skein enough to make the bag, please?